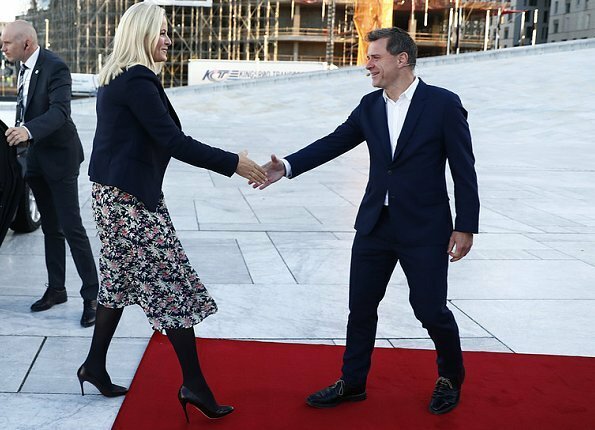 On October 16, 2017, Crown Princess Mette-Marit of Norway attended the Aftenposten Technology Conference held by Aftenposten newspaper at the Norwegian Opera House and Ballet in Oslo. Same old, same old. Floaty flower-y summer skirt paired with black opaque winter tights and dark top/jacket/coat. Mette-Marit is going to look like this from now until march (or make that may), and it´s boring already. Well, you can always tell the change to the cold season by the appearance of MM's black tights! I like the swingy floral skirt with enough black to balance the tights. Can't see jacket very well but like shorter cut. Agree, Pine. She loves this style and this is a fairly good version of it. I guess we will have to live with it through the winter! Exactly. This is what she likes and this version is one of the better ones. MM heeft haar zwarte kousen aan, voor de hele winter. Ihr Outfit gefällt mir sehr gut und ich mag sie sehr. Hm. As far as I can see it, M-M is a beautiful, statuesque woman who seems much-loved by her family and country and her vision of herself is of a blond with many flowers and black accessories, for a large part. Princess Victoria maintains her self-vision with pulled back hair and is also much-loved in her country. The same seems true of Queen Mathilde with her changeless style. If it works for them, why do we worry so much? They are successful women and don't seem to be terribly concerned about whether anybody else cares. I say, good for them! Whole heartedly agree!! I love the Scandinavian princesses for their brains and hard work, not their clothes. I think it's refreshing to see individual style vs. the princess-y, super expensive wardrobes of so many other royals. Good for them. Agree with everything you have said - but, I thought that the purpose of this site is to make fashion comments, albeit in a supportive way. Perhaps we should just look at the photos and leave it at that. I'll try to do that from this time.